Chapter XXVII: Piazza of the SS. Annunziata, and Hospital of the Foundlings – "Innocenti"
Che discese da Fiesole ab antiquo. About two centuries before Christ, the Etruscan city of Fiesole was conquered by Roman arms. The inhabitants were fierce and determined, and although, for the moment, conciliated, they seized every opportunity to protest against Roman supremacy. Their city, considered impregnable, was maintained by the conquerors as a strong military post: it still forms a conspicuous object in the views from Florence and its neighbourhood, a Franciscan monastery crowning the hill where once stood the citadel or acropolis of the Fiesolans. Fiesole was protected by three lines of walls, whilst a fourth embraced all the circumjacent territory, descending to the banks of the Arno, where the Fiesolan district was entered by three gates, with a mile between each. In the Port or lower city, an active commerce was carried on, chiefly, it is supposed, in iron, brought up the river from Pisa, and extracted in the Island of Elba. Fiesole was one of the most important of the twelve confederate cities of Etruria, which acknowledged their Lucumon or king in the capital of Clusium, the modern Chiusi; and it was even more celebrated as the seat of religious learning, than for commerce, or as a military post. The triple thunderbolt in the hand of Jove, symbolical of the three precious metals, was derived from Fiesole, and the city itself was believed to have been built by Atlas, and the tomb of one of his daughters. The rite of sacrifice and the science of divination were here taught by the Etruscans; even her Roman conquerors vouchsafed to learn in the schools, and annually sent twelve Roman youths hither to study augury. On urgent occasions soothsayers from Fiesole were brought to Rome, and Pliny mentions a Fiesolan with his seventy-four sons and grandsons arriving at the Capitol to perform the solemn sacrifices. The art does not appear to have been lost by their descendants, as Florentines were in the habit of consulting astrologers before commencing a war, or any great undertaking. The origin of the name Florence for the lower city has been variously explained. Some maintain that it was derived from Florinus, a Roman general, who encamped here, and was slain in a skirmish with the Fiesolans; others suppose Florence to be a corruption of the word Fluentia, from the town being situated at the confluence of the Arno and Mugnone; others again assert that Florence or Florentia only signified a flourishing city; but popular tradition ascribes the name to the abundance of flowers, for which the district is noted; lilies, the Iris Florentia, grow wild in the fields and in the clefts and crannies of the walls, and flourish now as they did two thousand years ago; for Florence is, and always will be, the City of Flowers. 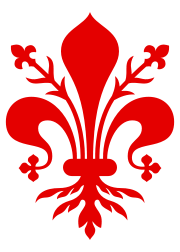 The lily, too, as the emblem of the Virgin, the patroness of Florence, is represented on the banner held by the favourite saint, Reparata, and is also figured on the red shield of the Republic. The decline of the ancient Etruscan city of Fiesole preceded the triumph of Sulla over Marius. When master of Rome, Sulla punished the inhabitants of those Italian towns which had taken the side of his rival, by depriving them of the Roman franchise, and by confiscating their territory to bestow it on his own soldiers. Twenty-three legions (by some estimated at forty-seven) received grants of land, among which was the territory belonging to Fiesole. These rude soldiers, however, showed themselves worthy of their Roman origin, and Florentia shortly presented a miniature copy of the mother city, with her Field of Mars, her Forum, Temple of Mars, Baths, Theatre, and Amphitheatre; there was even an aqueduct to convey drinking water from a distance of seven miles, for it appears that the waters of the Arno and the Mugnone were always insufficient for the supply of the city, and the springs were few and unwholesome. Both Tully and Sallust speak in terms of praise of the new colonists, but add that, owing to the superfluity of their wealth, they were so lavish in their expenditure in the magnificence of their buildings, and in their solemn feasts, that, to use the words of the historian, "Sulla must have returned to life to enable them to redeem their debts." Florentia early obtained the rank and privileges of a municipium, and Tacitus mentions that in the reign of Tiberius, an ambassador from the city appeared at Rome on a singular occasion. A question had arisen regarding the necessity of diverting some of the tributary streams of the Tiber into other channels to prevent the frequent inundations of that river, and the Florentines sent their ambassadors to remonstrate against the proposal of turning the Chiano from the Tiber into the Arno, which would have overwhelmed Florence. In the reign of Nero, A.D. 56, Frontinus and Paulinus, two recent converts to Christianity, arrived in Florence to introduce the new religion. A persecution followed, which was suspended under Titus and Vespasian, but renewed under Decius in the third century, when Florence contributed to the list of martyrs. The first recognised bishop was Felice, about A.D. 313. The existence of a bishop implies a cathedral, and such was probably the church of San Salvador, on whose site was afterwards erected Sta. Reparata, when the present Baptistery became pro tempore the cathedral. A few years later Sta. Reparata obtained this dignity, which she continued to hold, until demolished to make room for the beautiful edifice Sta. Maria del Fiore. The reason why the Florentines adopted Sta. Reparata for their patron saint is found in a legend connected with their favourite bishop, St. Zanobius. Early in the fifth century, Zanobius – a historical as well as legendary character – was chosen Bishop of Florence, and consecrated in the old church of San Lorenzo by Ambrose, Archbishop of Milan and one of the Fathers of the Church. Various miracles have been attributed to Zanobius, but his memory is especially held sacred for the aid he is said to have rendered, in the preservation of Florence from a horde of barbarians. In the year of our Lord 405, Italy was invaded by a leader called Radagasius, at the head of a host of Suavians, Burgundians, Vandals, and Goths, who, after destroying many cities, entrenched themselves amidst the heights of Fiesole and threatened Florence. In this extremity the prayers of the good Bishop Zanobius were heard, and, to the relief of the inhabitants, the sudden arrival of the Roman general Stilicho compelled the enemy to issue prematurely from their fastnesses, when they were repulsed with great slaughter, and the remnant were sold for slaves. The battle is said to have been fought on the 8th of October, the day of Sta. Reparata, who at the tender age of twelve had undergone martyrdom in Cappadocia, during the persecution of Decius, from which Florence had also so severely suffered. The youthful saint is supposed to have appeared in the midst of the battle, with a blood-red banner bearing the device of the lily in her hand. In commemoration of this victory, the church was built and dedicated to Sta. Reparata. 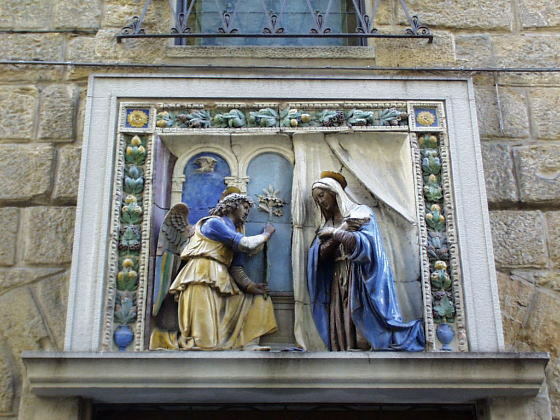 Zanobius, who was afterwards canonized, died on the 25th of May, A.D. 417, on which day annually the house he is supposed to have inhabited in Via Por San Maria, near the Ponte Vecchio, is decorated with flowers. The Florentines, in spite of Dante, do not forget their benefactors any more than he could forget the bello Ovile, "beautiful Sheepfold," as he called his beloved Florence. Though Florence was often distracted by factions, her history, compared with that of contemporary states, excepting perhaps Venice and Genoa, was one of advanced civilisation. The dissensions within the city arose from private sources of quarrel among the nobles, who summoned their peasantry from the country to their aid. These nobles were principally the descendants of German barons or marquises who had assisted the German emperors at various times in the conquest or subjugation of Italy. They held their lands in fief, acknowledging the emperor as their liege lord, and exercising an independent jurisdiction on their estates. The ancient Italian municipalities waged a continual warfare with these petty foreign tyrants, in defence of their rights and liberties; and they were supported by the Church, whose power increased when men of superior ability and resolution occupied the pontifical throne. Countess Matilda, the ruler of Tuscany, though her self a noble, and descended from German nobles, espoused the cause of the Church against the Emperor with religious enthusiasm. She was warmly supported by the Florentines, and she obliged some of the nobles, who possessed territory in the vicinity of Florence, to yield their lands to the canons of Sta. Reparata, and to the monks of Vallombrosa. The Lombards had already set a good example to the rest of Italy by taking advantage of the disputes between rival sovereigns, to establish free institutions, such as a council to control their lords paramount, and a senate and parliament of the people. As the Florentine municipality increased in wealth and power, they attacked and destroyed the castles of the feudal nobles in Tuscany, and obliged their former oppressors to reside in Florence, where they intermarried with the families of the citizens. The nobles had not, however, abandoned their pride with their possessions, and the infection spread in the city, which became a scene of warlike clans rather than the abode of peaceful merchants. Good sense, and increasing power derived from higher education and commercial wealth, enabled the citizens to establish order and to subdue, if not wholly to destroy, a barbarous aristocracy. But the growth of riches among themselves, accompanied with greater luxury and its attendant vices, prepared the way for the entire destruction of civic liberty. The struggles between noble and plebeian, Guelph and Ghibelline, Bianchi and Neri, ended with the ascendancy of unscrupulous ambition combined with subtlety, in the person of Cosimo de' Medici, and of his descendants for four generations. The most brilliant period of Florentine history dates from the beginning of the twelfth century to the year 1530, when the city fell into the hands of the younger branch of the Medici family, who destroyed the Commonwealth to establish a tyranny; and, though after the extinction of the Medicean Grand-Dukes, the Government assumed a milder form in the hands of the Austro-Lorraine dynasty, despotic rule did not entirely cease until the expulsion of Leopold I. in 1860. Nè per division fatto vermiglio. Nor by division was vermilion made. Florence, nestling at the foot of low hills, is bounded and sheltered to the north and east by mountains with their projecting spurs, whilst westward stretches a wide valley as far as Signa, where a narrow gorge connects this part of the country with that around Pisa. At Signa the Lybian Hercules is said to have drained the Golfolina or gulph, which has still the character of a lake or marsh, and to have removed a rock which impeded the course of the Arno. This labour seems, however, to have been imperfectly performed, since, when Hannibal passed that way, B.C. 409, the land was still a morass. Hercules, nevertheless, continued in favour, though Mars was considered the tutelar god of Florence. To the north of the city lies Monte Morello, a bold heath-capped mountain which was formerly overgrown with mulberry-trees; to the east is the range of Fiesolan Hills, and in the extreme distance rises the loftier height of Monte Senario, distinguished from various points round Florence by the monastery of the Servi di Maria," whose white walls on the summit, are more distinctly visible from their contrast with the dark woods around. Farther eastward, the noble line of hills above Vallombrosa divides the valley of the Arno from the fertile district of the Casentino and the lofty mountain of Falterone, whence the Arno and the Tiber have their source. South of Florence are lower ranges of hills, comprising those of San Miniato, San Giorgio, and Bellosguardo; beyond which range after range of the Apennines divide Florence and Rome. Si stava in pace sobria e pudica. The river Mugnone, which has at various times diverged from its original channel, after leaving the defile between the Uccellatojo and Fiesole, took once an easterly direction, and joined the Arno below, where is now the monastery of the Salvi; the course of the river was afterwards turned by the present Porta Pinti, and it flowed westward, below the SS. Annunziata, crossing the Piazza di San Marco, from whence it passed along the Via Cavour, and fell into the Arno below the Ponte alle Carraia. Later, the river was made again to diverge, leaving the church of San Lorenzo on the left bank: since which time its channel has been turned still farther west. Florence, at a very early period, was divided into quarters; San Piero Maggiore to the east; San Pancrazio to the west; Santa Maria sopr' Arno to the south, and to the north the Cathedral, which lay just beyond the oldest circuit of walls, of which to sole record is a slab inserted into a house in the Via Calzaioli. All beyond the second circuit of walls, which included the Cathedral, was called the Borgo or Borough. In the twelfth century the division of quarters, quartieri, was changed for sestieri – the Oltr' Arno, or district lying on the other side of the Arno; San Piero Scheraggio, where is now the Uffizi; the Borgo dei SS. Apostoli; San Pancrazio; the Porta del Duomo; and San Piero Maggiore. After the expulsion of a celebrated tyrant, the Duke of Athens, in the fourteenth century, the city was again divided into quarters, which bore the names of Santo Spirito, including all south of the river; San Giovanni; Santa Maria Novella; and Sta. Croce. Finally, the city was divided in three districts – Terzieri; viz., Santo Spirito, Santa Maria Novella, and Sta. Croce. The Cerchia Antica, or first historical circuit, has the date A.D. 785; Charlemagne built these walls in compliance with the wishes of the inhabitants, to replace those destroyed by barbarian invaders. A few feet higher up the river than the Uffizi, once stood the Castle of Altafronte. From this point the walls skirted the present Piazza del Grano and the Piazza di San Firenze behind the Palazzo Vecchio. At the end of the Borgo de' Greci was the Postern Gate, called De' Peruzzi, after the family of Peruzzi, supposed by some to have derived their name from the Church of San Piero Scheraggio, which in those early days was the largest in the city. From the Postern de' Peruzzi, the wall continued to the Postern del Garbo near the Badia, or ancient Abbey of Florence. This gate stood where is now the Canto or corner of the Pazzi. Beyond the walls lay the Borgo di San Piero, where stood the Church of San Piero Maggiore, of which nothing now remains but a single arch. The family of Portinara, who are by some supposed to have derived their name from this Porta, conferred distinction on the quarter, since opposite the gate lived Folco Portinara, who founded the Hospital of Sta. Maria Nuova, and who is still better known to posterity as the father of Beatrice, who inspired Dante with his divine poem. The last of the direct line of the descendants from the Visdomini died in 1730, and several noble Florentine families claim them for their ancestors. From the Postern of the Visdomini, the wall was carried along the northern side of the Piazza del Duomo to the entrance of the Via de' Martelli, now Via Cavour, where another postern was called the Spadai, after the swordmakers who inhabited that street. At the corner known as the Canto della Paglia, between the archbishop's palace and a palace erected by Arnolfo di Cambio, stood the Porta del Vescovo, or del Duomo. Passing the church of Santa Maria Nuova, the Piazza of San Gaetano, and the Palazzo Corsi, the Porta San Pancrazio stood near the old church of that name. San Pancrazio and the SS. Trinità were left outside the walls, but nearly facing this last church, and joining the houses of the Buondelmonti, was the Porta Rossa – Red Gate. Parallel with the Arno, by the Via de' Terme, where were the Thermæ or Roman Baths, and leaving the church of the SS. Apostoli on the right, the wall reached the Ponte Vecchio, the only bridge then existing in Florence. Near this lived the Amidei, the rivals of the Buondelmonti; and here stood the Porta San Maria or Porta Regina, the Gate of the Queen of Heaven. Close by was the church of San Maria, beneath an arch of which was suspended the great bell of the Caroccio, or War Chariot of Florence. The wall was carried on by the via Lambertesca and Via Castellani to the Castle of Altafronte. This wall was sufficient for the protection of Florence until 1077, when the Emperor Henry IV. made a descent upon Italy. Three years previously, the monk Hildebrand, Gregory VII., had been chosen Pope; and, impatient of the church patronage exercised by the German emperors, he had convened a council to devise means by which to oppose their interference in matters ecclesiastical. In a Diet convoked at Worms, the emperor declared Gregory's election null and void, and he forthwith crossed the Alps to wage war with the refractory pontiff. As the cause of Gregory was espoused by the celebrated Countess Matilda, daughter of Duke Boniface, of Tuscany, the Florentines dreaded a siege by the Imperialist army, and commenced a second circuit of walls to afford greater security to their city. Near San Piero Maggiore, which was now included within the walls, a postern gate was opened, called the Porta Pinti; thence, diverging in a northerly direction, the wall was carried towards San Michele de' Visdomini, just beyond the gate of that name. The corresponding gate was called the Porta delle Balle, from the bales of wool which here entered the city. When the Via de' Ginori joins the Piazza di San Lorenzo stood the Porta di Borgo San Lorenzo; and, passing the Canto de' Nelli by the Piazza Madonna, behind the Church of San Lorenzo, a small postern opened on the Campo Corbellini, and was called the Porta di Mugnone. The fosse, or ditch, beyond the wall has given its name to the street in this quarter, Via de' Fossi, as well as to others at the opposite extremity of the town. In Dante's time it seemed incredible that only a few years earlier so little jealousy should have existed among Florentines, that a gate of their city could be called after a private family. This postern communicated with the Porta de' Peruzzi in the old wall behind the Palazzo Vecchio, and houses belonging to this family are still situated in the district lying between the two. The wall was continued thence to the Porta San Piero. The city south of the Arno appears to have consisted of scattered dwellings, interspersed with gardens, which gradually became three regular streets; two of which lay along the river above and below the Ponte Vecchio, and the third led directly from the Arno towards the south.6 These had gates at either end, but no external wall, the houses themselves forming a rampart against any attack from without. The street above the bridge was first called Borgo Pidigliano, and was inhabited by the lowest of the populace until taken possession of by the Bardi, whose palaces vied with those of the wealthiest families in Florence. The gate at the eastern extremity stood near the present Church of Santa Lucia de' Magnoli, and was called the Porta a Roma, because it was the road to Rome by the cities of Figline and Arezzo. A second suburb parallel with the river, the Borgo San Jacopo, had a gate of the same name near the Ponte SS. Trinità, on the site of the Palazzo Frescobaldi. The third suburb, leading directly from the river, was called the Borgo di Piazza Santa Felicità, and the gate, the Porta a Piazza. When the second circuit of walls was built, it was thought expedient to carry them likewise south of the Arno, and they appeared to have been conducted from the Porta a Roma across the heights of San Giorgio behind the Boboli Gardens, and back to the Via de' Serragli, till they met the river at the Ponte alla Carraia. The rapid increase of the population induced the Florentine municipality in 1284 to build a third circuit of walls, embracing a wider circumference, for the protection of the citizens, and Arnolfo di Cambio was the architect chosen for the work. He erected a lofty tower, about a hundred and twenty feet high, behind Sta. Croce, and thence he carried the wall to the Porta all Giustizia, through which prisoners were led to execution. The next gate was that of Sta. Croce del Gorgo, from a whirlpool which had been caused by the meeting of the Arno and Mugnone, when the course of both rivers lay in this direction, and which had been commemorated by a cross. The Porta Guelfa followed; but the name of this gate was afterwards changed to Porta Ghibellina. Farther on was the Porta Pinti, bearing the same name as that of the corresponding gate in the second circuit of walls. At the farther extremity of the Via San Sebastiano was once a gate for the convenience of people coming from Fiesole or Majano to visit the church of the SS. Annunziata. Two small posterns between the Porta San Sebastiano and the Porta San Gallo afforded means of exit during the siege of 1529, when a bastion was placed before the Porta San Gallo. There were two gates on the site of the present Fortezza del Basso. 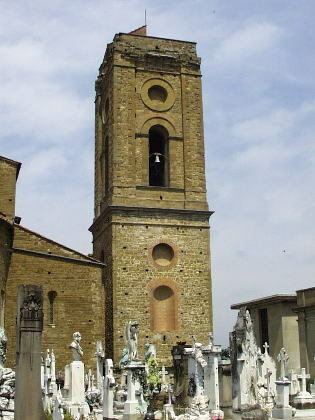 First in order was the Porta a Faenza – a name derived from the native city of one Ugoletto Cascianemici, whose wife Umiltà, in 1281, established a convent of Vallombrosian nuns near this spot; she employed Niccola Pisano as her architect, and dedicated the sacred foundation to St. John the Evangelist. Umiltà was canonized for her pious act; and she has been further immortalised by the painter Buffalmacco in a picture now in the Florentine Academy. The second gate, on the site of the Fortezza del Basso, was appropriately called the Porta Polverosa – Dusty Gate. The gate of San Piero Gattolino, now the Porta Romana, is still one of the principal entrances to the city, and near it was formerly another gate, used during the siege of 1529. The walls were carried over the crest of the hill from the Porta Romana to the Porta San Giorgio; following the abrupt descent, they reached the Porta San Miniato or San Francesco, called after the two monasteries on the height above. The Porta San Niccolo, the last gate south of the Arno, had its name from the church of San Niccolo in that district. The material for the last circuit of walls was obtained from the towers of the nobles, which by order of the Florentine municipality were reduced from their formidable height, and which had, until that time, been used by their owners as fortresses within the walls of the city. One of the peculiarities which strikes every stranger visiting Florence is the remains of these towers, with holes and brackets occurring at intervals, the entire height of the building. For an explanation of their use, as well as for a description of the houses inhabited by the old Florentines, we must refer the reader to the work of Count Luigi Passerini, the first living authority on the antiquities of his native city.8 "The dwellings of the Florentines were generally composed of a double wall of strong stone masonry, the interstices of which are filled by a cement of gravel and lime so firm that their destruction is rendered most difficult. Many of these buildings had towers attached to them, which were great objects of ambition to the most dominant families, at a time when the municipal guard was inadequate for protection, and when the strong were striving to raise themselves on the ruins of the weak. These towers varied in height from sixty to a hundred and twenty braccia.9 As they were first erected for strongholds during civil disturbances, they were kept well supplied with cross-bows and other implements for attack and defence. From loopholes placed at various intervals, assailants could be repulsed by arrows or stones. The towers were entered by a narrow doorway, and ascended by a very narrow staircase, probably in order to form a more effective barricade should the tower be forced. The battlements which crowned them indicated the party to which the owner adhered, being swallow-tailed if Ghibelline, square if Guelph. The projecting stones, which may be observed at some height from the doors of the towers, served to support a scaffolding of beams and planks, to which access was had by openings which may be traced, though now built up, and which at the time were kept closed by large shutters. From these scaffoldings, those within the towers could throw down missiles upon the enemy, and thus defend the doorway when besieged; at other times they were used on the occasion of any public festival, to collect the friends and relations of the family to witness processions. These wooden scaffoldings were called Torrazzi, probably the origin of the word Terrazzi, used for balconies." This is we may suppose the true explanation of the holes for the insertion of beams, the further ends of which rested in similar holes on an opposite tower, house, or even the lateral walls of a church. To proceed in our quotation: "The dwellings of the Florentines were not supplied with any modern comforts. The stairs were wide, but rude in construction, without ornament, except trophies, and the weapons with which every family was provided, ready to arm their dependants and the slaves (serfs) brought up from the country during civil commotions. The serfdom of the peasantry was only abolished in 1288 by a law which made it difficult for the barons to employ them against the citizens. An immense fire-place in one room served for the preparation of the frugal meals, and for the family gathering, in the long winter evenings. The whole furniture consisted in a rude table, a few stools, and a large chest, which the bride brought with her on her marriage, as her contribution to the household. The sole protection against the wind or the inclemency of the weather was shutters placed before the narrow windows, whilst a screen or curtain excluded the sun and summer heat. Florentine families continued to occupy the same house as long as it could contain them, and it was divided among the various branches for several generations until they became too numerous, when they endeavoured to procure the contiguous houses, that they might always remain near where their ancestors had dwelt, probably because the vicinity of their own people made it easier to unite in case of aggression." 1 Catiline's general was long encamped near Fiesole. See Cicero, Speech i., and Sallust. 2 Tierce or none – Tierce (Terza) is the first division of the Canonical Day – six to nine; Nones (None) the third, from twelve to three in the afternoon. The bells of the Badia rang these hours, and they measured the day. – See Longfellow's Dante. Abode in quiet, temperate and chaste. That caught the eye more than the person did. Shall in its downfall be, as in its rise." Fatten by staying in consistory." Which from the della Pera took its name." 6 See Captain Henry Napier's "Florentine History." 7 The Order of the Camaldoli was a branch of the Benedictines, founded by San Romualdo in 1077, with the idea of reforming the lives of the Benedictines. The parent monastery is situated in the Apennines in the Casentino, and the name Camaldoli was derived from the land on which it was built, Campo-Maldoli – Field of Maldoli. See "Legends of Monastic Orders," by Mrs. Jameson. 8 See Notes by Count Luigi Passerini to the romance of "Marietta de' Ricci," by Agostino Ademollo. 9 A braccia is nearly twenty-three inches.